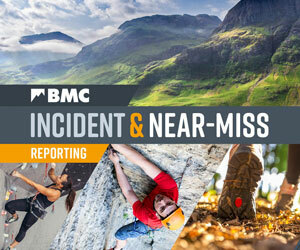 Mick Fowler, famous as the climbing taxman, and Dave Turnbull, the BMC CEO, have just successfully completed a major first ascent in Nepal. They have been to an extremely remote valley in the far western Nepal province of Mugu to attempt a fantastic line on a previously unclimbed mountain that has become known as Mugu Chuli (6310m) in the upper Kajichuwa Valley. "Success on Gojung (aka Mugu Chuli) 4 days up 3 days down + storm on top. Harder than expected and difficult descent"
Congratulations to all the team from everyone at the BMC. The line they climbed is above the faint red arrow in the photo above. BMC member Scott Mackenzie recently journeyed to the top of the world, and was kind enough to take us along for the ride! His recent summit of Mount Everest took him past the infamous Hillary Step, which is reported to have changed as a result of the 2015 earthquake. We tracked Scott down to find out more.